This sentiment is from Tim Holtz Life Remnant Rub Ons. It just sums up how I felt when the canvas was done! To make the sun and the rays, I first applied Wendy Vecchi embossing paste through a Viva Decor stencil, turning it to look like the sun. The embossed image so much texture and interest to the canvas! In this photo, I angled the frame and washed light over it so you could see the shine the Inka Gold added! That was my last step and I applied it with a tiny paintbrush to get in the fine lines. 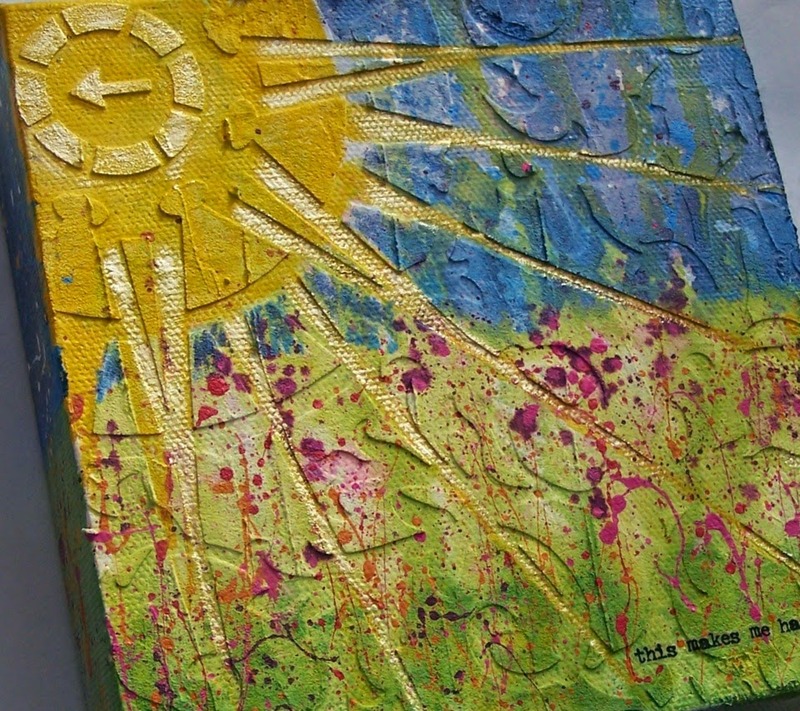 I think it adds the warmth of sunshine to the canvas! I also have a vivid imagination! 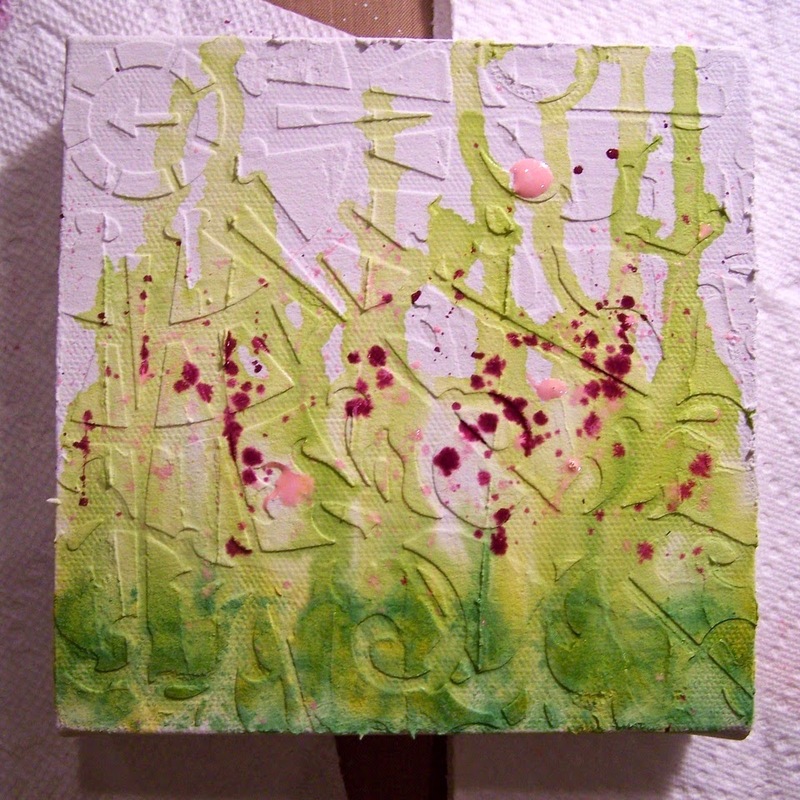 Here you can see the Wendy Vecchi embossing paste pattern left by the stencil. 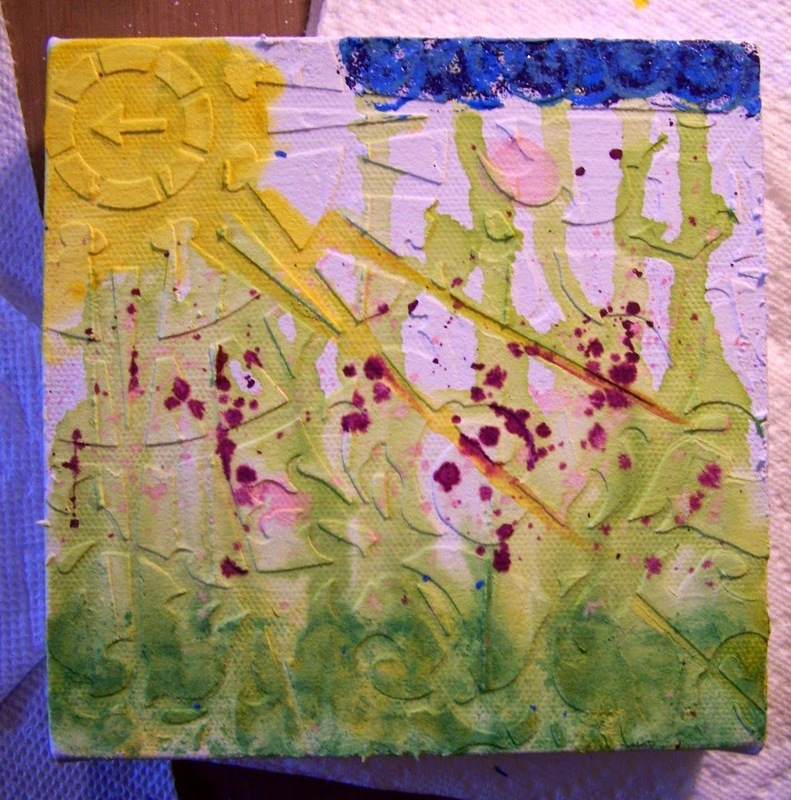 You can also see how I applied green and yellow and white TH Distress Paints along the bottom, turned the canvas upside down, and spritzed it with a Inkssentials Mister bottle until the paints marbled how I liked them. 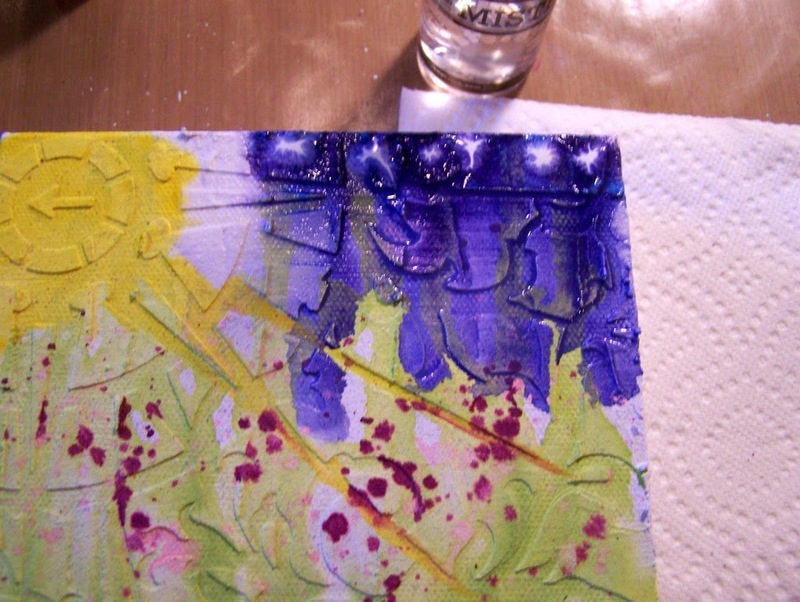 You can also see how I started adding paint splats with more TH Distress Paints to make flowers. I used the same technique for the sky base. I hope you like it and are inspired to try something new to you like I did! This is a great piece. Stunning. This makes me giddy, Sue! Amazing creation! This is fabulous Sue! You are such an upbeat and happy person so this feels as if it screams you! So Sunshiny! Nice work! LOVE seeing the process here Sue, this is AMAZING!!! Wow - this is super Sue! 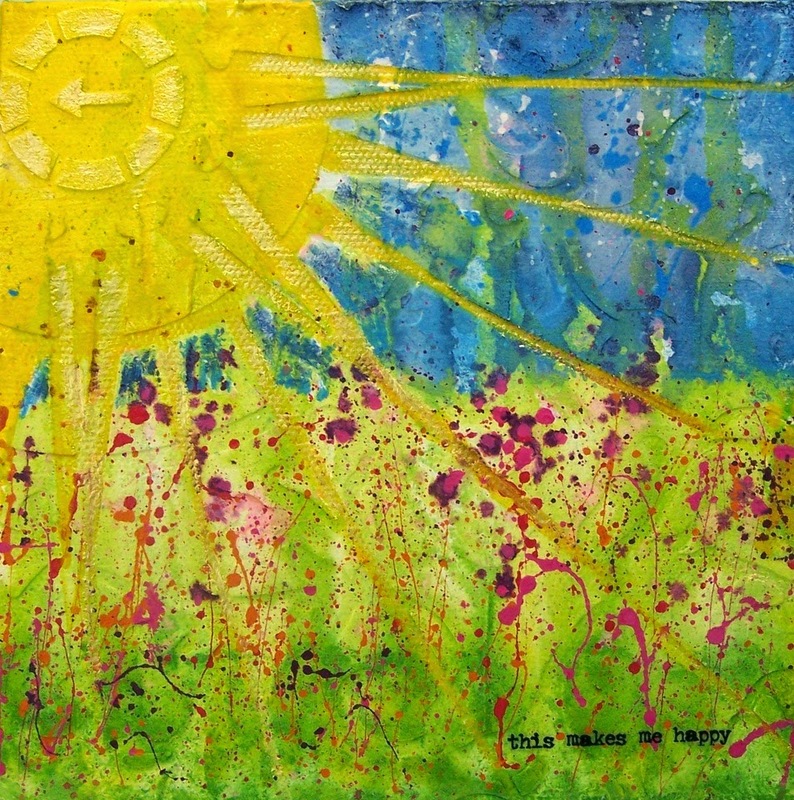 love the stenciled sun and the wonderful red splatter of blooms!